The AMD Turion X2 Ultra (and the AMD Turion X2) is the direct successor of the AMD Turion 64 X2 CPU and was introduced together with the Puma platform. These processors, code-named 'Griffin', are a combination of K8 core (Turion 64 X2) and K10 components (memory controller, crossbar-switch, HyperTransport 3.0 link). Furthermore, they differ to the old Turion 64 X2 CPUs by utilizing the so-called 'split power plane design', which allows independent voltage planes for processor and memory controller for greater control over performance based on system demands. So, it is possible to further reduce the voltage of the components. In former models the integrated memory controller mostly inhibited a further voltage decrease. The different power planes require discrete pins on the socket. So, the socket S1 was redesigned to S1g2 (generation 2). It has a separate voltage controller for each energising pin. Hence also former Turion X2 CPUs can be used in an S1g2 socket. However, older S1 socket notebooks cannot be up-dated by a new Ultra CPU. Another change concerns the energy saving technology. PowerNow! now supports that the clock rate is reduced to one quarter of the maximum (500-600 MHz at the time of writing). Furthermore, it supports an intermediate level with half clock frequency and reduced voltage. Finally, AMD also enhanced the L2 Cache. The Ultra CPUs now have 2x 1024 KB L2 cache instead of 2x 512KB of the former models. Compared to 6MB L2 cache of Core 2 Duo top models, AMD still lags behind. The AMD Turion X2 (without Ultra) processors are alike the former Turion 64 X2 only equipped with 2x 512KB L2 cache and so clearly slower than the new Ultra. 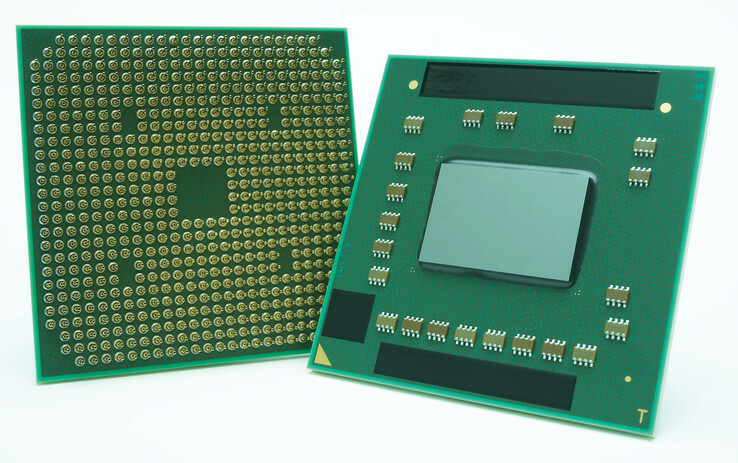 Similar to the Turion 64 X2 the two cores are based on the K8L architecture. So, they are very similar to the Turion 64 core and to the Athlon 64 X2 desktop cores. Each of the two cores has 128 KB L1 cache and 1024 KB L2 cache (depending on the model). Due to the small L2 cache, the Turion X2 is slower than the Core 2 Duo. The Turion X2 Ultra is produced is the 65nm (SOI) technology and supports the following instruction extensions: MMX, Extended 3DNow!, SSE, SSE2, SSE3, AMD64, PowerNow!, NX-Bit, AMD-V.
Due to the improved memory controller and having double the L2 cache capacity (Ultra) the Turion X2 should perform better than an equally clocked Turion 64 X2. However, it is clearly outperformed by the Core 2 Duo. In terms of performance it is rather comparable with a Core Duo respectively a Pentium Dual-Core processor.